In the last few years, Hansen Industrial Transmissions (HIT) has become very successful in selling single stage blower drives. Having no dedicated single stage solution for the larger sizes, a special solution was designed starting from the standard horizontal, parallel, 2-stage ‘Hansen P4’ housing (size G, H, J or K — with one gear set). What started as a one-off project has turned into recurrent business since. HIT sees a significant market potential for similar single stage drives, also outside Europe, mainly in the mining sector (e.g. for centrifugal slurry pumps) and for applications such as blowers, compressors and refiners as well as equipment for e.g. the chemical industry and the energy sector. These applications however would not benefit from a specific ‘large’ single stage housing i.e. those used for the P4 single stage units with a dedicated housing. HIT therefore reused its current robust P4 2-stage housing. Using its in-house resources HIT generated a large number of possible gear sets. From a mechanically optimized subset a final selection was made looking at dynamic and noise properties which led to a highly optimized gear set range. With a selection ratio up to 1% exact in almost any case the optimal working speed is matched as near as possible. The specially designed lubrication for this new product range — based on the multi Megawatt principle — ensures the gear set and all bearings are pressure lubricated. A new type of sprinklers caters for optimal oil distribution over the gear teeth. 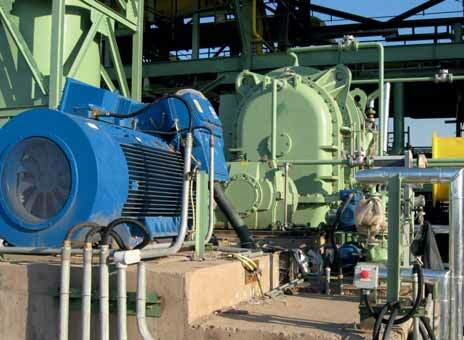 Due to the high installed powers, a cooling group is indispensable. Taking into account the high peripheral speeds at the shaft ends HIT provides its ‘Hansen Oil-lockTM’ sealing at all shaft ends and dimensions the oil drains large enough so no pressure is built up and leakage is prevented. ABOUT HANSEN INDUSTRIAL TRANSMISSIONS NV: Hansen Industrial Transmissions nv (HIT) is an established global industrial gearbox designer, manufacturer and supplier. The company provides durable gear drives for a wide range of industrial applications throughout the world and has established a dedicated international sales and service network. Its principal state-of-the-art manufacturing facility is located in Edegem, Flanders, Belgium. Since 2012 HIT has been part of the ‘Gearbox Division’ of the ‘Power Transmission & Controls Group’ of Sumitomo Heavy Industries Ltd. HIT employs over 400 people worldwide.